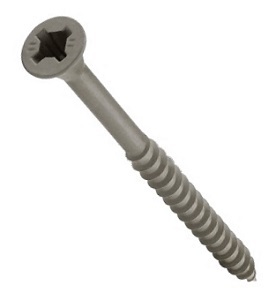 PRODUCT: #8 X 2-1/2" GRAY Lifecoat / ACQ All Weather Finish, Wood Deck Screw, #2 Phillips Drive, Flat Head, Coarse Thread, Sharp Point. ~108 screws/ 1-LB Box. Price/Box. DESCRIPTION: Features corrosion resistant exterior finish for decking, siding, outdoor furniture, spas, gazebos, treated wood (ACQ) and other exposed exterior construction.